The popular Tiong Bahru Market opened in 1951 as Seng Poh Road Market. It was then just “a simple wooden structure with zinc pitched roof”. Named after the street commemorating Singapore’s first Chinese Municipal Commissioner, Tan Seng Poh, the market was built to house a large number of street hawkers who had served the rapidly growing community at Tiong Bahru. It became an instant draw for the residents, many of whom had relocated from Chinatown. Many of the first vendors of the market were stallholders of an earlier “temporary” market which was built in 1940. It was just a series of sheds which had become an eyesore, a fire hazard, and far too small for the needs of the Tiong Bahru residents by the late 1940s. The estate had been growing steadily. In 1948, the government started building more than a dozen additional SIT blocks in the district which were ready for occupation from mid-1949. 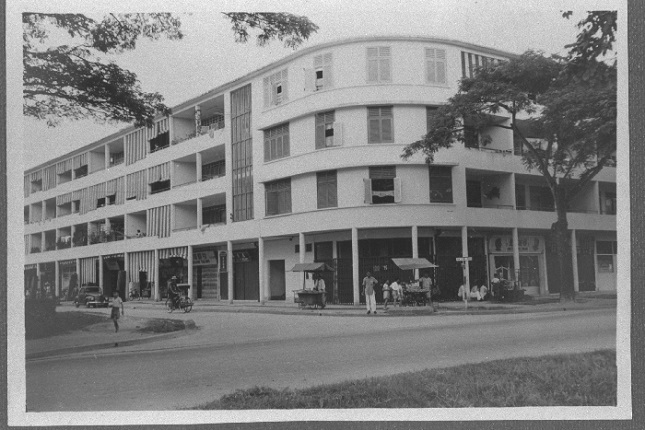 In September 1949, new plans were made to erect a further 18 blocks of flats in Tiong Bahru and Alexander Estates. By December 1949, the municipality decided that it was time to erect a permanent and larger market for the estate along Seng Poh Road. Works on the new market started in 1950 and it was completed by the end of that year. Officially named the Seng Poh Road Market, it was built to allow for cooked food stalls. In those early days, the new market also functioned as a kind of “Town Hall”, where important meeting were held and attended by residents of the district. The first of such gatherings occurred in March 1951 when the “town” gathered to decide on the establishment of a community centre for Tiong Bahru. It became a Polling Centre for the 1951 Legislative Council elections, and in 1953, it played the same role for the City Council elections. In the 1960s, political rallies were held there. By the 1970s, the old market was in great need of repair, looking old and dirty, there were also street hawkers lining its pavements. A decade later, besides serving the residents of the estate, the cooked food stalls in the market had also become important to, and a favourite of, a large number of nurses (from SGH) in the morning and office workers during lunch time. The old market was fundamentally a single-storey building with a triangular layout and had more than one entrances. The cooked food stalls were along the length of the back as well as taking up the whole of the right hand corner of the market. The food centre was arranged courtyard-style with the stalls ringing a central courtyard. The food centre, located outside the back of the market, was officially called Lim Liak Street Hawker Centre (Block 84A). When the whole market was revamped in 1993, it was renamed Tiong Bahru Market. The biggest change for Tiong Bahru Market took place in 2004-06 when the market and food centre were closed and a new building was erected. The new centre has also been endowed with user-friendly features with lifts, escalators and bigger stalls. Parts of the new building also incorporated an Art Deco style to complement the architecture of the surrounding estate. The Tiong Bahru Market & Food Centre is a two-storey building with a large central garden courtyard on a triangulated site. The fresh market, located on the first level, consists of 255 provision shops and wet produce stalls. The provision shops lining the peripheries help to enclose the morning wet produce market from the main road and generate night life to the building as they close late. The food court on the second level houses 85 food stalls surrounding pockets of eating spaces, with a seating capacity of 1,050. There is an urban park and garden as well as car parking facilities at the roof deck. All floors are handicapped accessible. Since the 1970s, the market and food court had already became known for its tradition foods, “specialising in Chinese breakfast foods and local specialities”. The market had food items which were not part of the “normal market breakfast repertoire” such as Cantonese chee cheong fun and wu thow kou. There was only one Malay stall at that time.